PEGAS has identified and was until recently monitoring over 125 social media sites that have posted 315 individual great apes (a minimum number) either for sale or already purchased. 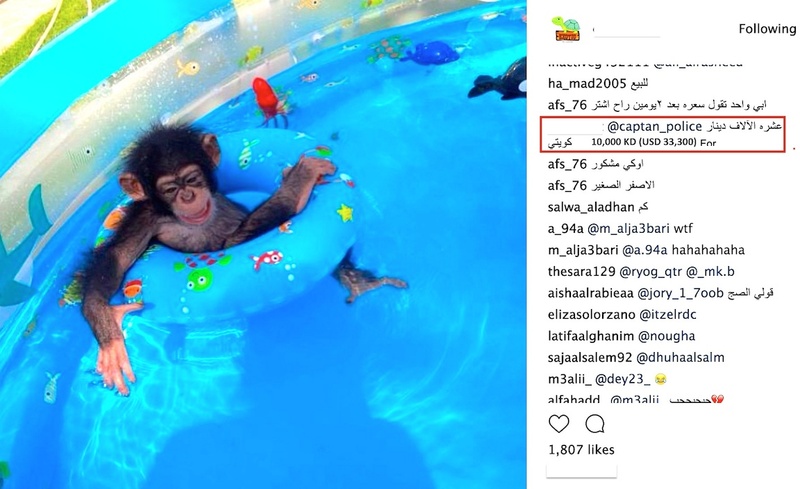 In addition, PEGAS has visited zoos and safari parks in several Middle Eastern and eastern Asian countries that are exploiting hundreds of great apes commercially, ranging in age from infants to old adults. 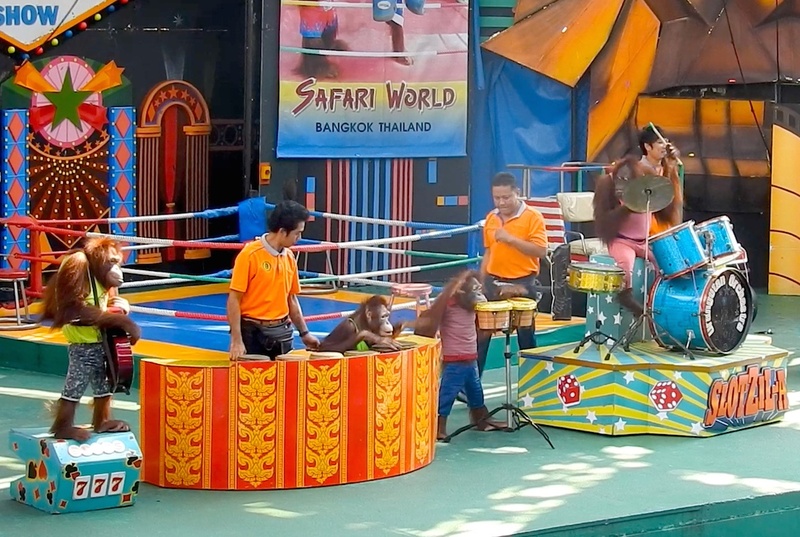 They act as fee-paying photo props with visitors, entertainment performers or as simple zoo attractions when they get older. 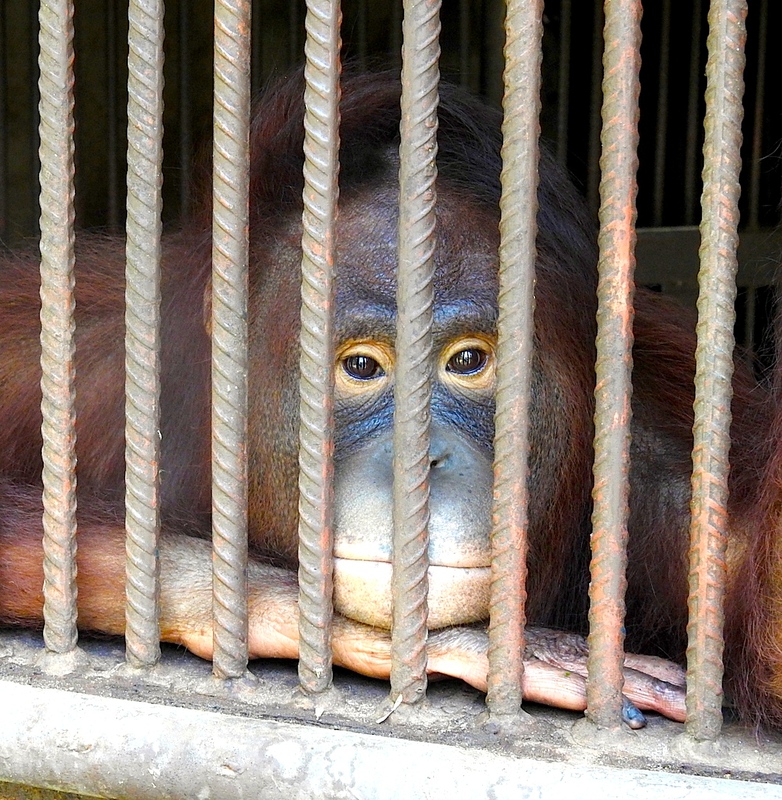 All of the great apes online and a high proportion of those seen in the zoos and safari parks were obtained illegally, many stolen from the wild. All of them have been moved from point A to point B, and many have been moved to point C and D and beyond, as they are bought and sold for various money-making purposes. 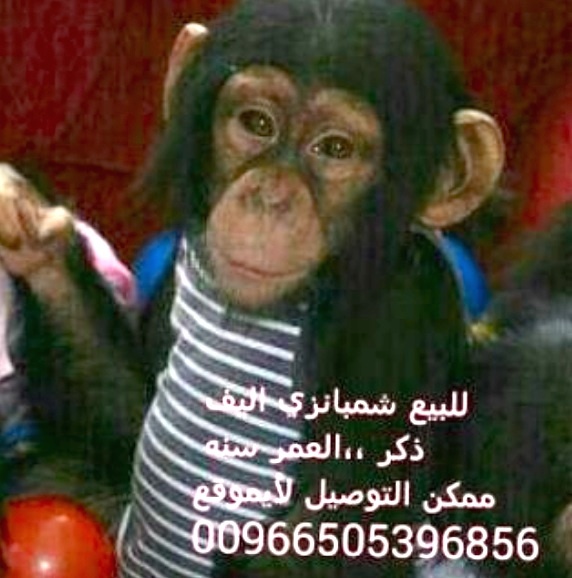 These apes suffer tremendously in these callous moves, which are done in part to cover up the fact that they were imported illegally into the destination country by the first buyer. The second or third buyer can show sales records to the authorities, but when asked for CITES, Customs or veterinary import documents, they just say, “Go talk to the importer”. That’s where it usually stops, as the authorities do not have the time or resources to go find the importers. If these great apes could be positively identified by some simple, non-invasive technology, that could be the breakthrough that wildlife trade investigators have been dreaming of. Identification using DNA or microchips has proven too difficult and expensive to carry out on a large scale. 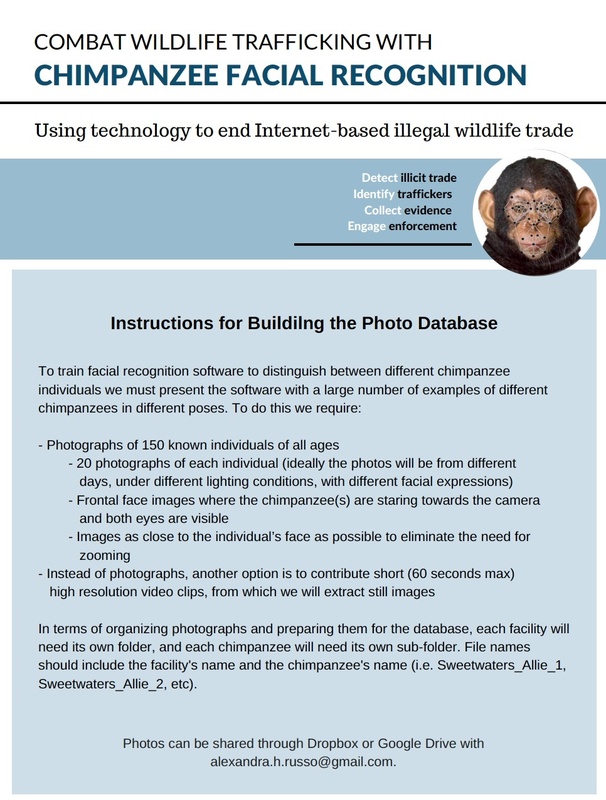 An ape facial photograph, akin to a police mug shot, could be the solution. 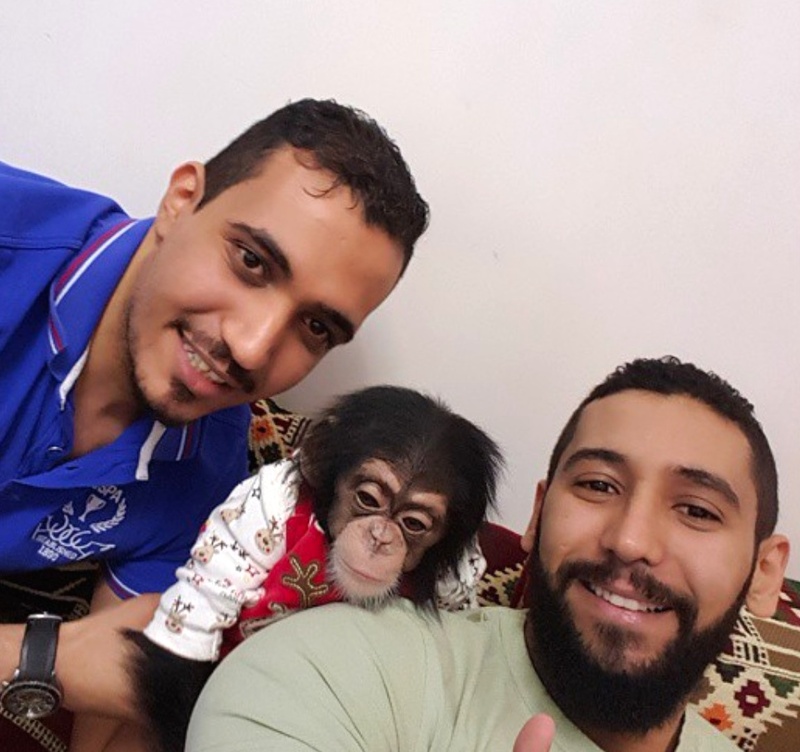 Wildlife dealers and owners post thousands of photos of great apes, most of them recurrences of the same ape. They are seen on multiple accounts as they are shared. It is not easy to determine if the same individual ape is posted on multiple accounts, unless the photos are identical duplicates. A facial recognition tool would enable the positive identification of each individual, as long as the face was showing at a good angle. Are these the same or different chimps? 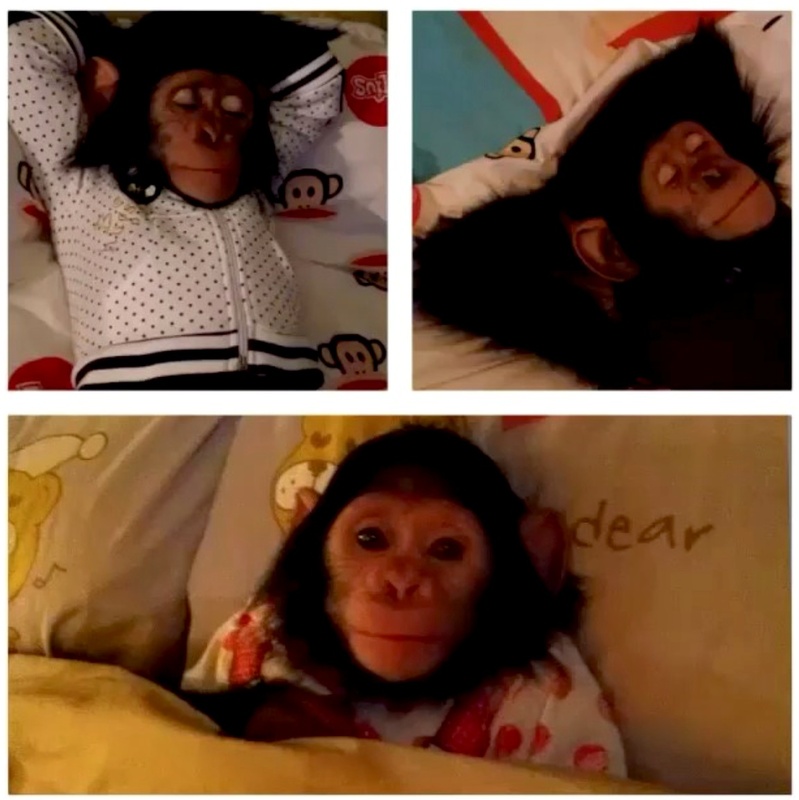 If we can positively identify an individual ape from its photo, it will be possible to track apes from seller to buyer online, and even from seller to buyer in zoos and safari parks, if the seller posted online the photo of that individual. It will also be possible to track movements of apes in zoos and safari parks, which may signal illegal arrivals, departures and replacements. This technology could even be used for prosecutions, depending on its accuracy. 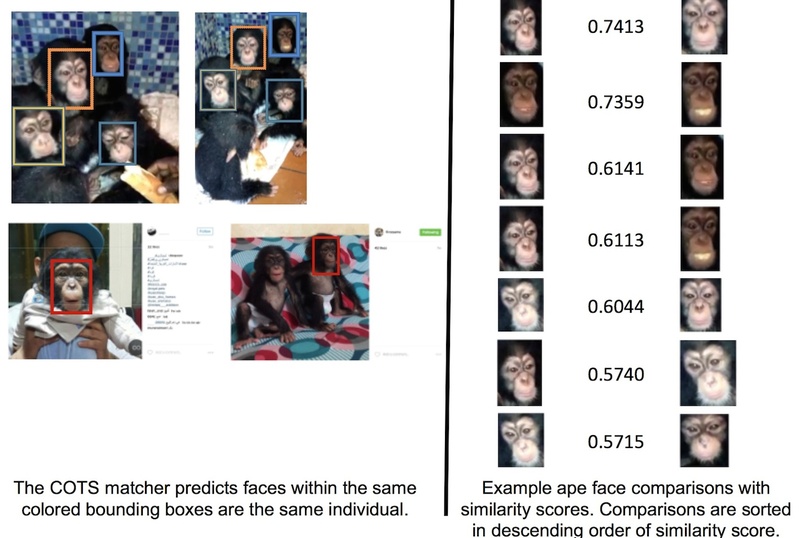 Dr. Anil Jain, distinguished biometrics professor at Michigan State University, and his team modified their human facial recognition system to create LemurFaceID, the first computer facial recognition system that correctly identified more than 100 individual lemurs with 98.7 percent accuracy. Dr. Jain and postgraduate student Debayan Deb have volunteered to adapt the LemurFaceID methodology to chimpanzee faces. If that proves successful, PEGAS hopes that they can repeat it with an orangutan face ID application in future. PEGAS is now working with dedicated wildlife conservationist Alexandra Russo, who has generously volunteered to lead the development of the ChimpFaceID initiative. Using a more advanced method than was used with the lemurs, titled PrimNet, based on Convolution Neural Network (CNN) architecture, the Michigan State team will analyze and test their technology on hundreds of chimp face photos that we are now collecting in collaboration with the Jane Goodall Institute, members of the Pan African Sanctuary Alliance and others. “I have brought together volunteers working at Sweetwaters Chimpanzee Sanctuary on Ol Pejeta Conservancy, Kenya, at Tchimpounga in the Congo, Tacugama in Sierra Leone and in the USA at Chimpanzee Sanctuary Northwest in Washington State and Save the Chimps in Florida to provide the photos,” said Alexandra Russo, nicknamed Allie. 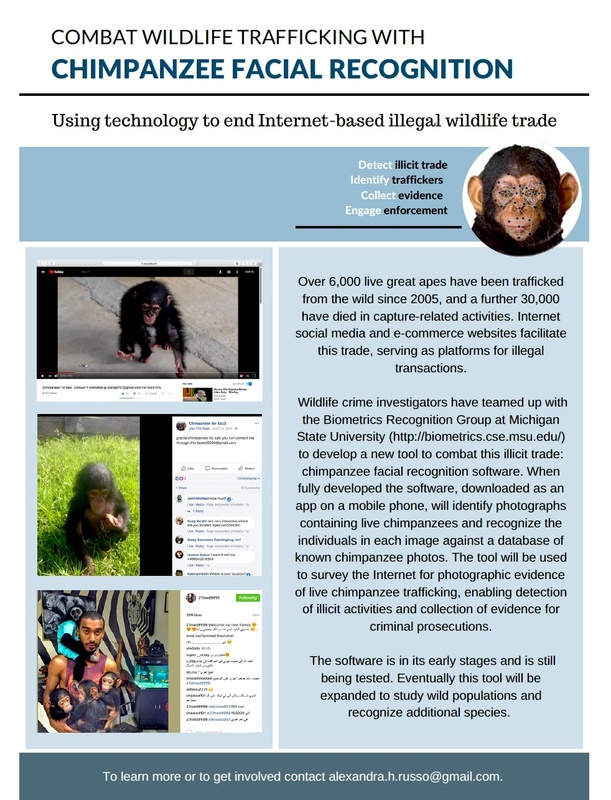 Although still in its initial stages, several organizations have shown interest in PrimNet for use in illegal wildlife trade investigations and for monitoring of great ape population numbers and distribution in the wild. We hope to be able to present an exposition of the application’s potential as part of Bio-Bridge Initiative at the 14th Conference of the Parties of the Convention on Biological Diversity in Egypt in November 2018. If the PrimNet technology works to the high 90s percent accuracy, investigators might one day be able to track an infant ape captured in the forests of Africa or Asia to a dealer selling it online in the home country to a dealer in the destination country and even on to the buyer. The photos, along with other evidence gathered in the course of investigations, could be used to arrest and prosecute the dealers, facilitators and even the buyer. 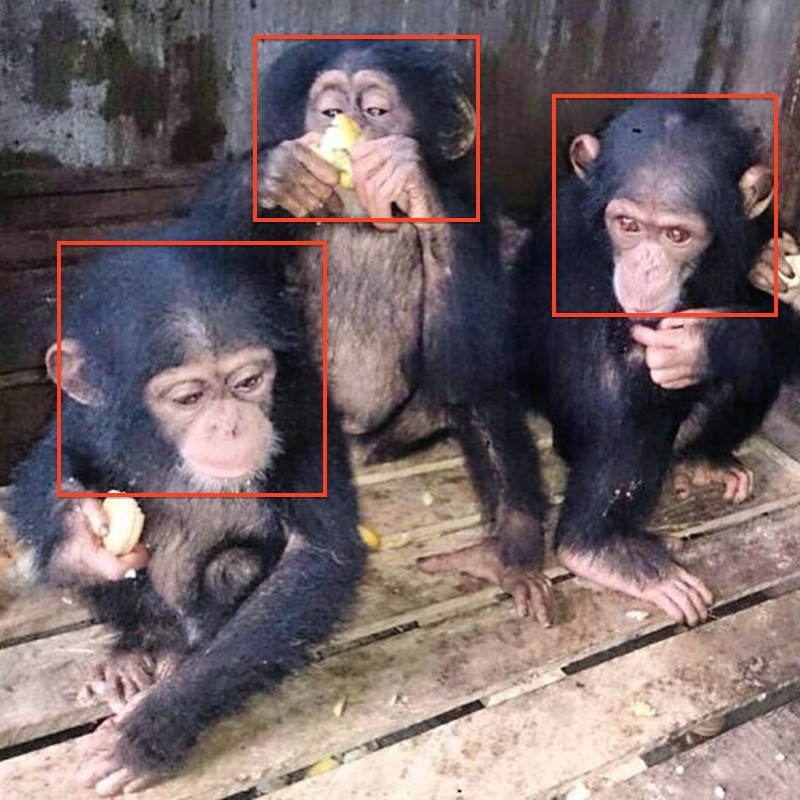 One day we may be able to positively identify chimp faces at point of origin, to dealer, to buyer. 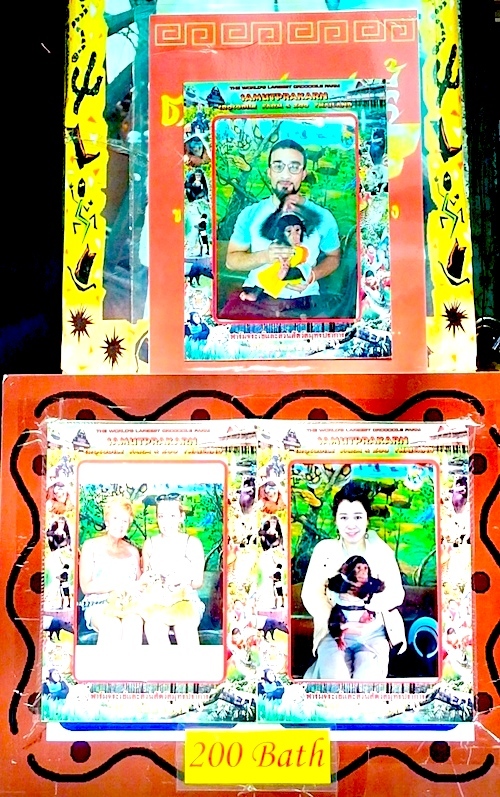 This entry was posted in facial recognition, facial recognition, online trafficking, PEGAS, trafficking and tagged ape trafficking, facial recognition, Jane Goodall Institute, PEGAS. Bookmark the permalink.